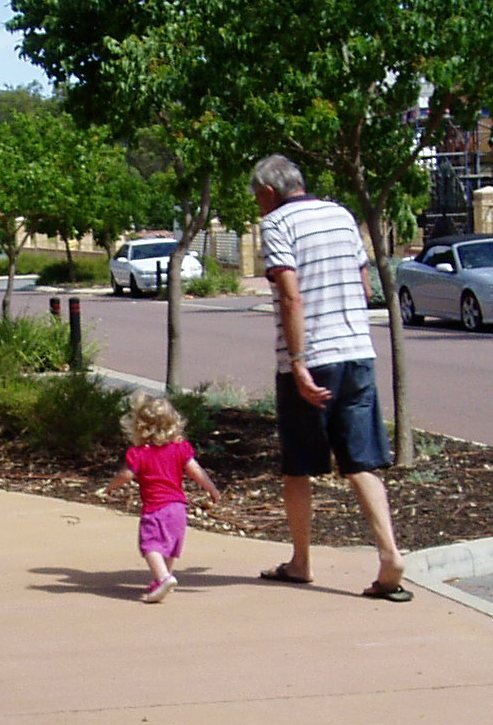 I took this photo of my husband and our youngest grand-daughter Juliet on Boxing Day. He is so BIG(6ft 3ins) and she is so little (19 months old) but oh, the attitude!! We had gone to the park and once she was out of the stroller and walking, well, that was that, there was no way that she was getting back in again. She must have walked a couple of kilometres on those little legs. Viv, that is such a cute photo...I can see how she would be a handful. OHHHH that is so very precious Viv!!! What memories!!! Ohhh that stride!! How wonderful to be a happy child, striding out to take on the world...especially with Grandpa watching out for her.